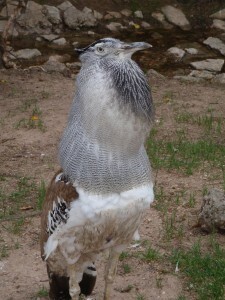 The kori bustard is the world’s heaviest flying bird. The weight of an adult male may exceed 30 pounds, and at the height of three feet, it is the tallest of the 23 species of bustards, an Old World family of crane relatives. These large birds are omnivorous. Insects are usually the major part of the diet, but seeds, small mammals, and reptiles are also commonly eaten. Range: Eastern and Southern Africa, dry savannah and open bush. Kori bustards have deep, harsh voices and bark explosively if alarmed.